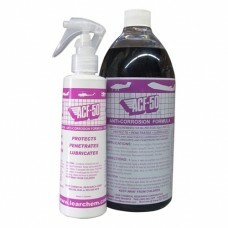 ACF 50 Anti Corrosion Formula . Stop corrosion in its tracks! 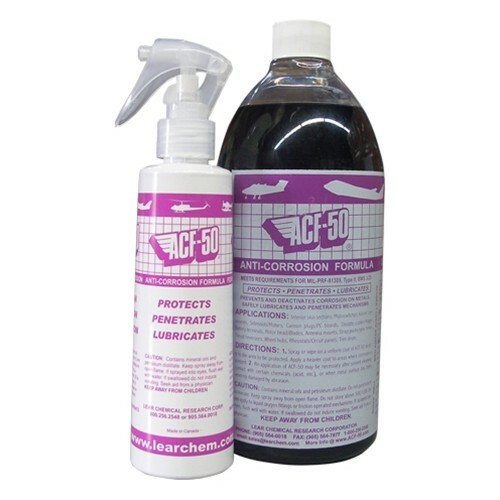 ACF-50 terminates the corrosion process. It penetrates corrosion cells and stops electrolysis. It will not repair damage that has already occurred, nor remove heavy scale associated with severe corrosion. Once treated, the scale will eventually diminish and the corrosion will remain in check. As a penetrant use ACF-50 to spray parts, cables, electric motors, hinges, etc., and allow it to soak. ACF-50 has a strong affinity for metal; it cuts through corrosion build-up and loosens frozen parts. It can even make corroded teleflex cables operate like new.Avionics and electrical components:ACF-50 will not harm avionics or electrical components. It is ideal for use on bus bars, circuit panels, canon plugs, connectors and antenna bases. Printed circuit boards can be sprayed, as well as rheostats and switches. Spray into: wing sections, fuselage, vertical & horizontal stabilizers, hinges, teleflex cables, air vent cables, trim cables, throttle cables, battery boxes, engine compartments, avionics, antenna mounts. Spray into: tail boom section, engine compartments, strap pack, landing gear, air vent cables, rotor head, grip areas, avionics, antenna mounts, cannon plugs. Spray or wipe on blades. Spray into: wing sections, fuselage, vertical & horizontal stabilizers, landing gear compartments, micro switches, avionics, cannon plugs, cargo door brackets, garbage chutes, galleys, lavatory areas, belly skin sections, main spar sectionsSpray into: floats, fuselage, vertical & horizontal stabilizers, wing sections, bilge area, exterior of motors, connectors, cannon plugs, avionics, micro switches, antenna mounts. Spray into: trim drum actuators, micro switches, landing gear and compartments, wheel hubs, thrust reverse mechanisms. Wipe on nacelles. Interior metal surfaces, structural assemblies, micro switches, avionic components, solenoids/motors, battery terminals, rotor head/blades, antenna mounts, strap packs/gear boxes, thrust reversers, wheel hubs, rheostat/circuit panels, trim drum. Its uses on motorcycles are very similar to those on aircraft. Sprayed into the structure, joints and welds i.e. under the tank and seat, frame and steering head area , under panels and on hidden parts of the engine, radiators, engine cases, forks, calipers, wheels, anywhere on. Where corrosion is already evident it will help . It will also penetrate around bolts, screws and hardware protecting them and preventing seizure. Exposed engine and gearbox cases, swinging arms, forks and other exposed parts will benefit from ACF-50's thin film technology by not corroding, will stay looking good and will clean up easily after a salt laden ride. It will protect electrical joints, PCB's and electronics as well, such as computerized ignition and fuel control units and their multi pin plugs, while switches, controls and levers will all be lubricated as well as protected from corrosion. Multi pin plugs and connectors benefit from having ACF-50 applied directly to the contacts.